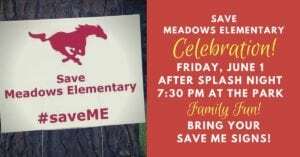 The City of Meadows Place, in response to resident requests, is holding a Save Meadows Elementary Celebration. In a break from tradition, Splash Nite will be closed down a little early and the party will shift over to the park where there will be live music, food trucks and gourmet snow cones. Games, dancing and a gathering of all the folks who helped the city save the school will fill the evening showing once again that Meadows Place is………Your Place for Life !